Take without food or water! Contains Vitamin B6, B12 & Niacin scientifically proven to support energy release. 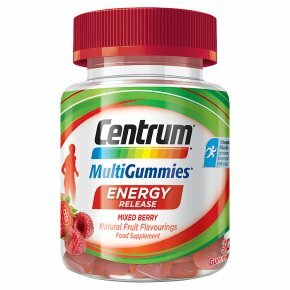 Centrum MultiGummies Energy Release are a deliciously fruity way to help reduce tiredness and fatigue. Available in Mixed Berry flavour, made with natural colours & flavourings and no artificial sweeteners. Centrum MultiGummies Energy Release provides you with a balanced formulation of vitamins & minerals and with no need for food and water, you can enjoy them whenever and wherever you want. Directions for Use: Two gummies per day. May be taken without food or water. Do not exceed the daily recommended dose. This product should not replace a balanced diet and healthy lifestyle. Do not use if the foil on the bottle is broken. Always replace the lid after use.<br><br>Store out of reach of young children. If taking other supplements, please read the table as they may contain the same ingredients. If you are pregnant or breast feeding, consult your doctor before taking this product.